This service / site is shutting down at the end of 2019-01-31. Twitch has disabled VOD uploads on certain accounts and also added a 50 videos per day limit on others on 2018-12-26. They are however unable to provide any information on these limits and their intentions going forward. This makes it impossible for me to run a reliable upload service. 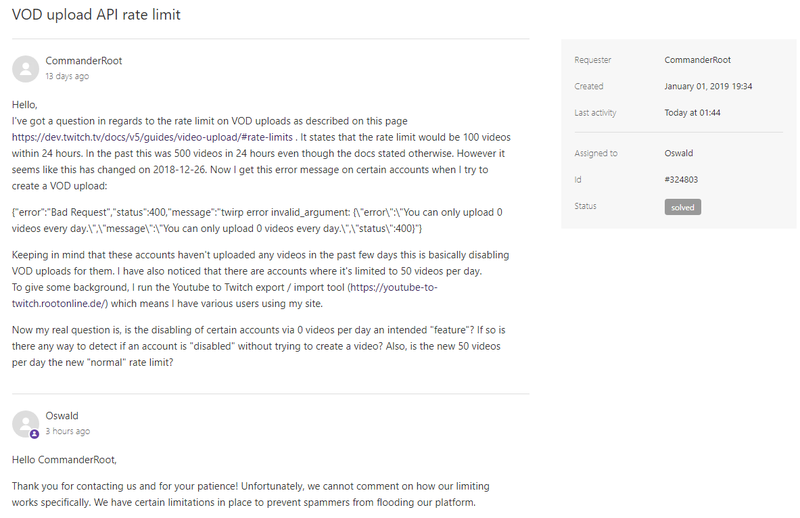 If you are seeing a rate limit message when trying to transfer videos then it could very well be your account being VOD upload disabled. The service will try to transfer any videos until the shutdown date (2019-01-31), however I can't gurantee that it will work on all accounts as mentioned above. Thank you for using my site, it was a pleasure providing this service.